I only post this because it is out there and I've got to think it will have an eventual impact on the Bulls. I’ll leave it to those more knowledgeable than I to make sense of it. The Rays claimed off waivers a catcher in the San Diego system named Jose Lobaton and assigned him to Montgomery. The puzzle is that they put him on the 40-man roster. But maybe you have to do that if you’re trying to get someone through the waiver system (if I'm showing my ignorance surely someone will correct me). Here’s the odd part: The Rays now have five catchers on their 40-man roster (Navarro, Hernandez, our John Jaso, re-habbing Shawn Riggans, and the new guy, Jose Labaton). Here’s what makes it even weirder: Not one of them appears to be a top quality major league catcher. OK, I like Michel Hernandez and would love to have him in Durham, but how good is he, really? Hard to tell with his lack of playing time. So you’ve got to think that a couple of those guys are not long for the Rays. First, let me apologize for getting it wrong in my post yesterday. For some reason I thought the double header would be like the one we had here last Saturday. It wasn’t. Instead they just started at one o’clock, played 7 innings, took a break, and played another 7 innings. We all know how important pitching is, but if ever we needed it pushed into our faces it was today. In two 7-inning games that were over in a total of 4 hours, Bulls pitching was dominant (the first game) and got hammered (the second game). Let’s start with Jeremy Hellickson. He got in trouble in the 1st inning giving up a hit and a walk early. But with men on second and third he closed it out with a strikeout. He gave up another walk in the 3rd, a single in the 4th, and a single in the 6th. That was it. In the meantime, Ray Olmedo (!) had an RBI single early and hit his sixth home run in the 7th for what was certainly the surprise of the game. Reid Brignac had a timely double in the 3rd that got the scoring going. Two more runs in the 4th. And Olmedo’s homer in the 7th. Dale Thayer closed it out for his first appearance since coming back. No surprise that he had some trouble, just like the last time he came back. He gave up a rare home run, but got things under control. Hellickson’s had two very solid games for us. He actually is performing better than when David Price first showed up here in mid-August last year. On the other hand ... The last time we saw Matt DeSalvo was when he came on in relief of James Houser on July 26th. He pitched a very solid 5+ innings and only gave up one run. Today he started and gave up 5 runs in 3 innings, 4 runs in the 1st, 1 in the 2nd. James Houser and John Meloan blanked them in the 4th and 5th, but Jorge Julio gave up 3 runs in the 6th. Ugly, ugly, ugly. Pretty clear that DeSalvo is not a reliable starter. Jorge Julio’s numbers are even worse. Our guys never got on track at bat in the second game, although I should note that Craig Albernaz went 2 for 3. If only he could get a few more at-bats he might get up above .200. Just a quick note for those who may not have noticed. After last night’s rainout, the Bulls will play two games today. The first starting at 1:05, the second at 7:00. The first will be on 99.9, the second only via computer, unless you can get HD2, whatever that is. Shawn Riggans will be joining up today or sometime soon. Will complicate the roster, but what’s new there? Seems like a long time since we’ve seen Riggans in the DBAP. The often-injured catcher remains highly thought of (well, enough to stay on the Rays 40-man roster), but his history doesn’t match the tough-guy aura of most major league catchers. Personally, I’m worried that Craig Albernaz might get pushed off into the Hudson Valley hinterland, but I’m guessing that will depend on how long Riggans stays with us. And if Albernaz is off to Hudson Valley, Jamieson might be completely off the reservation. Speaking of rosters, we’ve got 14 pitchers on the books at the moment (if you ignore Hudson Valley transactions). One or two of those is going to have to go somewhere eventually. My guess is that folks are waiting for the trade deadline to go to see what happens. Then they can make some moves to sort things out. By the way, the Geezer Gala apparently went off OK. See a couple of stories here and here. I had a brief chat with groundskeeper Scott Strickland the other night. He assured me that the gala wouldn't harm the poor Bermuda. I was worried about the walkers and wheelchairs digging divots out. Adam Sobsey comments on the IL in general over at Triangle Offense. Taking off from that I’ve got to note that, even though I really don’t pay much attention to other IL team rosters, trades like the ones yesterday that involved several AAA players will really shake the rosters up. I’m too lazy to chase them all down (that’s what Neil Solondz does for us if you can check the early part of his broadcasts). You’d think that the IL website would do a story, but it hasn’t so far. I was wrong. The double header is to be played as back-to-back seven inning games. First game already over (Bulls won 6-2) and the second game has just started. The Durham Bulls showed their disdain for small ball last night and it sure sounded great. Home runs accounted for 3 of the runs, while the fourth run was a bit more small ballish (single, double, ground out RBI in the 2nd). Elliot Johnson hit two to go with his one last night, the interesting feature being that he hit one batting left and the other batting right. Matt Joyce got the third one. We got a full eight innings from Andy Sonnanstine and another very efficient save (10 pitches) from Jason Childers. That’s four saves in five days on 31 pitches. He did slip up and let a runner on base last night. Tsk, tsk. We’ve got the best record in the International League now. Trading deadline stuff: Rays Index has a summary of what he considers the possibilities. Update: It's been pointed out to me that Louisville has a slightly better record than the Bulls, so we have the second-best record in the IL -- sigh. Oh well, we could fix that tonight if all goes well. The Bulls are at PNC Field in Moosic, Pennsylvania tonight. Brian Merzbach over at Ballpark Reviews doesn’t think much of the place. And it has had some problems this year (thanks for the link, A). The Yankees beat the Bulls in the Governor’s Cup last year and currently are a couple of percentage points ahead of us in this our first meeting (we play them in Durham in the middle of August). So, this should be fun for all. The photo tells part of the story of last night — Craig Albernaz did a terrific job at the plate. Nice try, but Norfolk's Fiorentino was wrong. He was out. Henry Mateo is holding the ball in his glove there and the tag was good. Fiorentino was out on his attempted steal in the 4th, just like Gathright was out when Albernaz picked him off first base in the 1st. Albernaz also had an RBI single in the 5th that almost (but not quite) got him above the Mendoza line. No wild pitches, no passed balls. I’m becoming more impressed with our backup catcher. Wade Davis was not at the top of his game last night, but the team backed him up well with a double play, pick off, and the aforementioned strike ’em out, throw ’em out, attempted steal. Reid Brignac made two very nifty plays, one in the 3rd and another in the 6th to end the inning. He’s showing a pretty good glove this year, and his RBI double in the 5th really got things going. This isn’t the best umpiring crew in the International League — Beal, Crabill, and Rackley. The blown call at the plate in Sunday’s game (in our favor) and the one last night (in Norfolk’s favor). What appeared to be some very inconsistent strike calls at home plate, and a couple of others that I can’t seem to bring to mind. I was up on the top of the Blue Monster when Ruggiano got tossed, but according to Adam Sobsey some unkind words were exchanged. No surprise there. A great home stand! The Bulls took on the Tides and won 4 out of 5. Can’t ask for any more than that. By the way, DRR called it in his comment yesterday. Dale Thayer is on his way back to the Bulls, not that Shouse did Tampa Bay much good yesterday. I’m not even going to try to figure out how Durham’s going to sort out the pitching staff for this trip up to Scranton. Trading deadline is upon us, but really hard to tell how it may play out. Think I’ll just wait and see. Rhyne Hughes has been with the Bulls for 40 games or so since coming up from Montgomery. His rep was as a power hitter and he’s shown that to us the last couple of games. A bit streaky, though. To put it in context, before the weekend he had 4 games where he was 0 for 18. Nevertheless, you have to respect the streak, especially when it wins games for us. On Saturday afternoon he went 4-4, two doubles, two singles. On Saturday evening he went 2 for 4, a double and a single. Last night he was 3-4 with a single, double, and home run. That pushed his batting average up to .310 and his OPS up to .921, leading the team in both categories. If you’re looking for a good reason not to trust baseball statistics, look no farther than last night. On paper, Jason Cromer, my favorite Durham Bulls pitcher, had a terrible night even though he stayed with it for 7 innings and 31 batters. He gave up 11 hits. But the Tides could only get two runs across and Jason got a win. Part of his success was the two double plays behind him. But seems to me the biggest unmeasurable part of it was his concentration. Even with Jaso’s indecision regarding a bunt in front of him that put runners and 1st and 3rd, Jason stayed with the game. Then there’s Jason Childers. Three days, three games, three saves with a total of 21 pitches. Jason leads the team and may lead the IL in appearances with 41. I think that I haven’t appreciated what Jason’s brought to the Bulls this year. He’s been with AAA ball for a long time, including a good year with us back in 2006. If you take just a look at his stats from 2005 through this year, he’s been in a ton of games with Richmond, the Bulls, and two years with Charlotte. Decent stats, in fact superb stats, last year in Charlotte. So this is a guy that Charlie knows well and is doing a great job for us this year — out of the pen he’s got 8 wins, not bad. Let’s call him the Jon Weber of the pitching staff. Back when May he was traded to Baltimore with an assignment to Norfolk, I made a note that it meant we might get a chance to see Joey Gathright in the DBAP again. I was looking forward to the day (and hoping that he didn’t mess us up too badly). He’s been on the DL and made his first appearance with the Tides in quite a while last night. He wasn’t the Gathright that we knew back in 2004, 2005, and 2006. Back then when Joey got to first base you knew you had a shot at getting a run across. Last night he barely took a lead off first the one time he got on. I’m guessing he was being careful with the hamstring/groin pull that he’s dealing with (not sure which, didn’t have my radio on last night). Here’s hoping he gets back in shape. Certainly one of the most exciting baseball players I’ve ever had the chance to watch in the DBAP. After last night’s interesting variant on the National Anthem I thought it was time for an update. Diligent readers will recall the meticulously scientific approach to this topic. Last night the sound system went out as a couple was launching into their rendition, and then cut in and out for the duration. 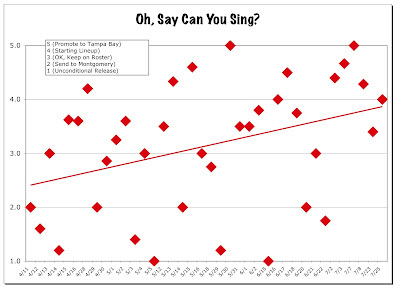 Interestingly, and very impressively, we thought, the fans decided to sing on their own. Which presented us with a distinct challenge. We could judge ourselves, but that meant recognizing that only two of us could carry a tune. The vote spread was two 5’s (they're our wives — we’re not complete dummies), two 0’s (guess who), and one DNS (Did Not Sing). Or we could try to judge the moments when the vocalists could be heard. We decided to go with the second choice. This may take a tad longer than usual, so I thought I’d lead off with some interesting stuff not necessarily related to yesterday’s games. The strengths and weaknesses of the webworld showed up during the afternoon when Reid Brignac didn’t come out for the 3rd inning of the first game. For an example, see Rays Index. Adam Sobsey does a great job of capturing how it played out in the press box over at Triangle Offense. To recapitulate the kerfuffle (always wanted to use that word), since Brignac is the object of a lot of trade rumors his coming out of a game might have meant he’d been traded. Whomever was speaking for the dugout didn’t help matters by putting out two different stories. By then the tweeterdom was alight. But then Brignac did play in second game, the webworld quieted down and all was well, even if Adam still thinks (and he could easily be right) something may be afoot. But the really cool link is the News & Observer’s feature on Jon Weber and the Blue Monster. Who’d a thought that the N&O would even cover a Bulls game, much less write anything interesting? Well, Luke Decock did. Of course, since it’s about Weber I’ve got to highlight it. Too bad that they are so stingy about their photos or I’d have put one of those up too. Lot’s of neat trivia about how to play the wall and its various quirks. Lastly, thanks to Rays Prospects we’ve got some news on Mitch Talbot. He pitched a couple of innings for the Gulf Coast Rays yesterday and had a good outing: 1 hit, 5 strikeouts, no walks. Oh yeah. Two baseball games yesterday. I will admit up front that a prior commitment kept me from the first game, although I did catch much of it on the radio. There is life outside baseball, not very interesting, but life. Have to say that what really got my attention in the first game was Weber’s hits (homer and a double) and Jason Childer’s save. For Childers that made it two games and two saves in a row, and talk about efficient — 4 pitches on Saturday night, 9 pitches on Sunday afternoon. That’s efficient. What I missed, until Neil Solondz pointed it out during the next game, was Rhyne Hughes going 4 for 4 with two doubles. In the second game we witnessed an interesting (maybe the wrong word, how about ‘painful’) role reversal. Through June I’d been less than impressed with James Houser and somewhat tolerant of Matt DeSalvo. Then Houser went to the bullpen and pitched two long sessions (3⅓ and 5⅓ innings) where he did just fine. His last start on July 18th was superb. He went 7 innings and only allowed one run. Seven days later he was awful, lasting only 3 ⅓ and giving up 7 runs. Matt DeSalvo, who I’d been hoping had missed the bus in Indianapolis after his six crummy starts in a row, came out of the bullpen to pitch 5⅔ innings in relief and his best performance of the year. I’m too lazy to dig out the rule book, but seems to me the scorer is letting Jaso off the hook too much. DeSalvo got charged with four wild pitches. I of course cannot fail to mention that Jon Weber got two more doubles (that’s 35 on the year), raised his batting average to .293, and another RBI. This time I did notice Rhyne Hughes and he continued his streak going 2 for 4 with a double. The Durham Bulls take first place away from the Norfolk Tides and have a terrific return home to the Durham Bulls Athletic Park. The story out in the Rays World is going to be the AAA debut of Jeremy Hellickson and I have to say that he looked pretty good. 6 innings, 2 runs, 5 hits, 3 walks, 6 strikeouts. So he starts out with an ERA of 3.00. Not bad at all. He was solid in the first three innings with 5 Ks, 1 hit (a single), and 1 walk. A bit shaky in the 4th and 5th, when he gave up the runs. But handled himself very well in the 6th when a runner reached on an error and a single moved the runner to second. He closed out the inning with two strikeouts. This was the first time I’ve seen right-hander John Meloan, who came to us on the Abreu trade. He looked better than the numbers he’s put up since his arrival, going two innings and not allowing a run. And then Jason Childers as a closer! Nifty double play and he got his first save. Ruggiano crushed one over the bull for the first two runs. And his brilliant catch in the 8th kept Norfolk from creeping up on us. Another homer from Chris Richard in the 8th gave us some breathing room, otherwise I’d be writing about all the guys we left on base in the 1st and 3rd innings. Gotta at least mention the condition of the field. This is the worst I’ve ever seen the grass at the DBAP. I’m not sure what’s wrong, but some serious work needs to be done. Maybe they’re waiting till after the geezer’s concert this Friday, but the infield really doesn’t look very playable now, much less through August. 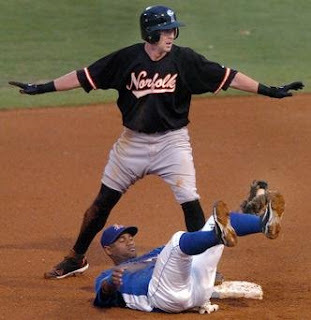 Have to add a rant about how home plate umpire Damien Beal let Norfolk’s Jake Arrieta start the game at a snail’s pace and then slow it down to a crawl. It took almost two hours to get through the first four innings. Arrieta even wasted throws in an apparent attempt keep Chris Richard on base! Richard’s got one steal on the year and I think that was on a passed ball. Fortunately, Arrieta was out of the game after the 4th, and took the loss. So there. But Beal didn’t have to let it happen. Oh, about that picture. The Bulls are auctioning off those jerseys the guys wore back on the 3rd of July. Just thought it showed my favorite Bull in good form. That was back when he had hair. He doesn’t any more. Did it help? Maybe. Weber was 2 for 3, with a walk, a single, and his league-leading 32nd double. DRR mentioned this in a comment yesterday, which I sort of blew off. Then Cork Gaines over at Rays Index expanded on the thought with more links and a poll. So I thought I’d pass it on to those who may have missed it. Cliff Lee of the Indians for Wade Davis and Reid Brignac? St Petersburg Times and The Rays Party. OPS is the On Base Percentage plus Slugging. Most statistics-watchers think that OPS is a better indicator of a player's skill than batting average, and I tend to agree. None of these numbers here are particularly stellar, although they aren't bad either. Richard’s OPS is 10th in the IL. Eight current Tampa Bay Rays are in the 800s, three of them with better OPS than Richard. Small ball was enough for a change, and Wade Davis did a really fine job allowing only 1 run on 3 hits, 4 walks, and 9(!) strikeouts in a solid 6+ innings. He didn’t get the win, but it was still one of his best performances of the year. Also nice to see Jason Childers get a win and Dale Thayer get a save. Thayer has had a tough time recently, but here he goes back to back and does a good job. Plus bullpen gets a break for a change. Hitting star was Chris Richard going 3 for 5 with 2 RBIs. I had thought that since Sonnanstine starting tomorrow, someone was definitely going to have to leave the rotation. But, incredible as it might sound, I could be wrong. The Bulls have five games in four days this weekend before they hit the road again. I wonder if Hellickson is just up for a spot start to help the Bulls get through the next couple of days? Top prospect right-hander Jeremy Hellickson is coming to Durham and scheduled to start on Friday. [The Heater]. Hellickson has been bothered by a shoulder injury this year, limiting his starts in Montgomery to just 11 games. He was 3-1 with the Biscuits with an ERA of 2.38 in 56⅔ innings. I’m betting his pitch count will be limited with us, but what’s new? By my count that’s six starters: Sonnanstine, Hernandez, DeSalvo, Cromer, Houser, and Hellickson. So someone’s about the move to bullpen or get pushed off the bus. Unless Sonnanstine isn’t ready to come off the DL. Have the Bulls been striking out a lot these last few games (especially on Sunday)? I decided to take a look and came up with the chart above. 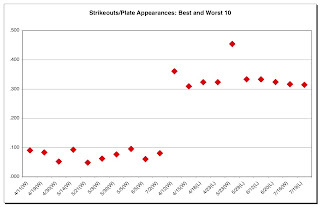 What the chart shows is the ten games with the least number of strikeouts (as measured by number of strikeouts per plate appearance) and the ten games with the most strikeouts. The interesting thing is that we won all the ten games with the least strikeouts and we also won four out of the ten games with the most strikeouts. Without doing much more work than I really want to do, it sure looks like the relationship between strikeouts and winning and losing games is there, but not very strong. Where strikeouts really hurt is in the small ball games like last night. Last night wasn’t too bad (.195), not nearly as bad as the night before (.315), but we just couldn’t push the runs across. A while back I mentioned that this year’s Bulls seemed to live and die by the home run and that doesn’t seem to have changed. What was the Bulls front office thinking when they let the International League establish this bizarre schedule? Two weeks on the road? This is the Durham Bulls. How come they don’t play in Durham? The only benefit I can see with this schedule is that the grass in the DBAP might have a chance to recover a bit. Does anyone take the players into account? Does anyone take the fans into account? What’s the point of having a starting pitcher in mid-July who’s limited to 75 pitches? Apparently the Rays have told Montoyo that Carlos Hernandez is limited to 75 pitches or 5 innings, whichever comes first. I understand their concern over his health and, perhaps, their hopes for his future (he’s had a couple of good games for us), but if they’re really concerned with limiting his pitch count why not just put him in the bullpen? Am I missing something here? I really don’t want to say anything about last night’s 13-inning game. I missed the radio broadcast and, after taking a look at the wrap and Adam Sobsey’s story, I’m glad that I did. One item did catch my eye, Matt Joyce got tossed for arguing balls and strikes. That’s the second time this season (that I’ve noticed). Hope that isn’t a sign of things to come. Montoyo usually makes a player sit out a game after getting thrown out. We’ll see about that tonight. In the meantime, here’s the next in my series of Top 5 Bulls. No real surprises at the top of the list, but I didn’t realize that Matt Joyce and Rhyne Hughes were doing so well. Pleased to see that. If you don’t get on base, you can’t score a run. In the unlikely event that there is any continued interest in these last two marathons, here is the take on the games by the local newspaper here, and here. Sometimes the lack of short-term memory is a good thing. We split the series. On to Indianapolis, just up the road from Louisville, so not a long ride on the bus. It turns out that the glove used by Carl Crawford when the made the MVP-winning catch was originally Jon Weber’s. Worth looking at the video at the link to see a nice catch. So the mystery of Jon’s propensity to discard bats may be solved — he’s got a lot of them. On the other hand, I'm confident that he would prefer to be wearing that glove (or any glove) in left field, in the Trop. I have to confess that two batters sort of snuck in on me here. I didn’t realize how well Jon Weber and Reid Brignac were doing. Good for them! I rarely criticize Charlie Montoyo, if only because he’s forgotten more about baseball than I’ll ever know, but I just don’t understand his decision last night in the 8th inning. The Bulls were ahead 2-1. James Houser had just put in a very solid seven innings, only allowing one run. Montoyo then sent closer Dale Thayer in for, I suppose, a 2-inning save. In the previous two games since the All-Star game Montoyo had used 3 of his relievers (Childers, 1⅓ innings on Thursday; Bateman, 2 innings on Thursday; and DePaula, 1 inning on Friday). So he had at least three other relievers available for the inning (Medlock, Julio, or Meloan). Instead he used Thayer, who got through the 8th OK.
Then, after one out in the 9th, Dale gave up two doubles and a run, allowing Louisville to tie the game. By the 14th Medlock (1 inning), Meloan (2 innings), and Julio (2 innings) had all been used. So Childers came in for the 15th. And Bateman came in for the 16th, after the Bulls scored a run at the top of the inning. Joe started off with another heart-stopper, a 4-pitch walk, but then he got two fly-outs and a ground out to finish the game in the 16th. So, Montoyo used every one of his available relievers, plus Childers and Bateman. Surely by the end of the game he was regretting his decision eight innings earlier. Lost in the (let’s call it was it was) tedium of a 16 inning game was Louisville’s Ben Jukich’s 6-inning no-hitter that unfortunately for him went into the 7th and was spoiled by a Matt Joyce home run, and then Elliot Johnson hammered one in the 8th (his first hit off a left-handed pitcher this year!). Also lost was James Houser’s best game of the year. Did he finally show why he’s on the Rays’ 40-man? Not lost was yet another hit by Elliot Johnson in the 16th that scored Craig Albernaz for the winning run. For the musical celebration of the ages (or is it just age?) the Bulls are peddling a tie-dyed t-shirt. I hate to point it out, but tie-dying became popular long after either Dylan or Nelson hit the national scene. Still, maybe it will be nice to see two guys who are even older than I am playing at the DBAP. I only caught bits and pieces of last night’s game, so I commend to you Adam Sobsey’s write-up over at Indy Week’s Triangle Offense, and Neil Solondz’s wrap linked to above. As Adam noted, we’re playing a lot of very close games these days. Also, as one of my fellow observers up behind first base keeps reminding me, sometimes it’s about development. Davis had an awful 5th inning and Montoyo left him in for all of it and on into the 6th, where he did a very credible job. With a well-rested bullpen, you’ve got to wonder, if winning were the only thing, why a reliever wasn’t warming up in the 5th. On the other hand, what better time to find out how Davis deals with adversity? I realize that almost anyone reading this blog knows how to find Bulls stats. Nevertheless, sometimes I think it’s fun to take a look at who’s helping us the most. And sometimes I get surprised. 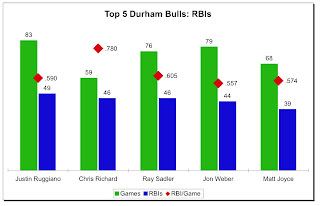 The chart shows the top five Bulls when it comes to RBIs. I woud have never guessed that Ray Sadler was up there as #2 in RBIs/Game. If he could hit lefties this year (and he’s bound to start one of these days), he might be #1. As I speculated yesterday, Montoyo is going to mess with his rotation some. What I would never have thought, however, was that James Houser might be back in it. He starts tonight. So it looks like he may be back as a starter (unless it has something to do with Sonnanstine’s mono). After thirteen starts, Houser went to the bullpen where he’s made two appearances, both of them fairly long — one for 5 ⅓ and one for 3 ⅓. Overall his numbers are better than DeSalvo’s. Chris Mason has been released by the Rays. He’s been with Montgomery most of the season, except for his short visit to Durham back in early June. Flip Flop Fly Ball has a couple of new posters up. Rays Index (and others) have really stirred up a storm regarding a rumored Carl Crawford trade. As a die-hard Bulls fan, I don’t have much of a dog in that hunt. However, I have to comment on the general myopia of Rays bloggers about the Bulls. Last time I looked, we’ve got four outfielders and, as good as he is, Matt Joyce is not the best of them. Most of the concern goes back to the Jackson/Joyce trade, but we don’t have a dog in that hunt either. I missed my workout at the gym yesterday, so my heart hadn’t had its usual workout. Joe Bateman fixed that in the bottom of the 9th last night. The Durham Bulls had just tacked on an insurance run in the top of the inning and were ahead 4-1. Bateman had come on for Childers in the 8th and set Louisville down 1-2-3 with a strikeout, groundout, and a strikeout. But Thayer wasn’t available since he’d had a long outing in the All-Star game (Adam Sobsey detects something nefarious in Thayer’s non-availability). Bateman’s gone a couple of innings before, so I wasn’t too worried. But that was before a double, a single, another double, and another single brought two runs in and men on first and second. A ground out moved the runners to second and third. An intentional walk filled the bases with one out. (OK, check the old heart. Yep, it’s right up there.) Bateman strikes out the next two batters. Game over. Bulls alone in first place. Now I can get around to admitting that my guy, Jason Cromer, did not have his stuff last night. He pitched what was probably his worst game of the year and got a win with good defense behind him and good offense scoring runs for him. Guess that’s how baseball goes. Brignac, Ruggiano, and Jaso were not in the lineup. Brignac apparently got in late from Portland. Ruggiano is still recovering from his bruised hand. Jaso lollygagging where? Kansas City? Tampa? The Rays had a day off. It was the veterans Chris Richard and Jon Weber who made the offensive difference. Richard got a homer, a single and 2 RBIs (he’s getting his eye back). Weber got three hits (two doubles and a single) and scored a run. Ray Olmedo and (get this) Craig Albernaz got the other two RBIs. The break gave Montoyo the opportunity to mess with the pitching rotation. Wade Davis is supposed to start tonight (would have been DeSalvo if pre-break rotation kept up). Suspect it will be a couple of days before the rotation settles out. Over at The Rays Party they have ranked the prospects currently in the Rays system. 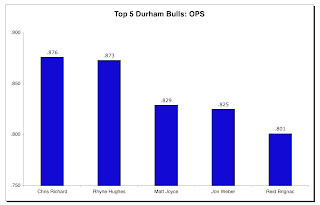 Current Durham Bulls are: Wade Davis (1), Reid Brignac (4), John Jaso (9), Mitch Talbot (11), Rhyne Hughes (16), Justin Ruggiano (19), Elliot Johnson (23), and James Houser (28). Also at Rays Party is the beginning of a series explaining pitch f/x. If that is as opaque to you as me, then might be worth taking a look at and maybe we can educate ourselves. Traditionally the Louisville Bat have the highest average attendance of any team in the International League. This year they are running slightly behind the new parks in Columbus and Allentown (Lehigh Valley) averaging 8,600 fans per game (the Bulls are averaging 6,300 per game so far). The Bats currently have a 9½ game lead in the West Division with a 51-39 record, exactly the same record as the Durham Bulls. We took 3 out of 4 in our series back in May, but it’s likely they’ve had a bunch of roster changes. Their manager, Rick Sweet, managed the International League All-Star team and the Bats had two players, pitcher Justin Lehr and outfielder Drew Stubbs, on the team. Update - 3:57 pm: Tonight's game at 7:05. Jason Cromer pitching. Ruggiano's hand is bruised, not broken, so decision to play will be based on how he feels during batting practice. Good news!! To be honest, I couldn’t get very excited about the AAA All-Star game. I did watch the first hour or so and Portland’s got a very interesting-looking ball park. On the other hand, I guess that there’s a problem with camera placement. Felt like I was sitting way up in the stands looking down instead of the field-level feel you get in most broadcast games. Reid Brignac fielded his position well and got an RBI double. Dale Thayer went 1⅔ scoreless innings. Hope the trip to Louisville went well for them both. WDBB must have a friend over at the FF&B law firm. We have just received a copy of a letter from them to one of our most famous Durham Bulls. We thought our readers might be interested. Especially on this day when the player in question should be in Portland and playing in the All-Star game. Farfaleaux, Foghart, & Bloviate, L.L.C. As you may know, our firm represents various clients in both legal and media relations capacities. In addition, from time to time we are also called upon to assist in the marketing endeavors of our clients. For some weeks we have been attempting to contact your business agent; however, since we were unsuccessful, I thought that I should contact you directly because I am firmly of the belief that this is an opportunity not to be missed. Our client is a North Carolina-based forest products company and owner of the famous Get-a-Grip pine tar brand. As you may know, the use of pine tar on bats has been in a steady decline with the introduction of metal bats. So much so that there are very few brands left in the business. On the other hand, with the recent upsurge in broken bats, Get-a-Grip sees an opportunity to become the leader in what is apparently a growing market. The idea of the campaign is actually rather simple. With your record thus far this year (at least 6 bats into the stands by our count) you would be perfect as a spokesman for the “before and after” effects of using Get-a-Grip. Brilliant, wouldn’t you say? We simply collect a few videos of you tossing your bat into the stands of the DBAP, or other stadium of your choice; then follow it up with several of your signature doubles; then have you deliver a testimonial to the efficacy of Get-a-Grip, perhaps with the famous “snorting bull” in the background. Unfortunately, Get-a-Grip has insisted on a contingency clause in any potential contract which I, as their attorney, am bound to honor. It is this: from the signing of the contract there can be no further instances of bats going into the stands. That is not likely to be a problem, is it? I am sure you understand that further incidents would severely undermine your chances of being selected for the position. What do you think? Can we perhaps meet during the next home stand? For AAA the All-Star break comes at a point well past mid-season. We’re at 90 games, 18 past the 72 games that mark the first half of the season for us. And we only have 27 home games left before the playoffs begin. Although we looked at these numbers recently, thought they might be worth another look before things start up again. What jumps out at me in the pitching chart is the lack of depth. Of the five, only three have seen very many starts as Bulls (Davis 18, Hernandez 17, and Cromer 9). Of course, Sonnanstine had a bunch of starts with the Rays and if his mononucleosis is under control he will be a huge asset the rest of the season. I have no idea of Mitch Talbot’s status. He had 10 starts before he went on the disabled list and were he to come back, we could certainly expect a lot from him. So, that leaves only Matt DeSalvo as a weak starting pitcher. Childers, DePaula, Bateman, and Thayer are obviously the core of our relievers and they are all doing credible jobs. It’s hard to tell how James Houser might work out as a reliever, but not bad so far. Similarly, Medlock’s status is uncertain. There’s something going on with him that appears to have nothing to do with Bulls as a team, but with roster juggling. Certainly his numbers are just fine and we’d be better off with him available in the bullpen all the time. We’ve only seen 3 innings from Meloan, so he’s impossible to judge. Julio is unimpressive. So what do we have to worry about? Well, that’s pretty simple, the Tampa Bay Rays. The Rays 40-man roster has five of our pitchers on it: Talbot, Davis, Sonnanstine, Houser, and Thayer. The Rays also have three pitchers on their disabled list, all relievers, but only one that appears to be coming off any time soon (Brian Shouse). 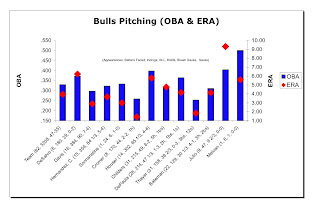 For the Bulls that should mean that, except for Dale Thayer, our current crop of relievers should be safe from call up. Among our starters, my guess is that it would be a coin toss between Sonnanstine and Davis. Are any of our pitchers trade bait? Hard to tell. The Rays’ problem at the moment appears to be the bullpen. Would they trade a promising starter for a proven reliever? Maybe, but this is the team that has already traded two proven pitchers off this year (Jackson and Hammel), so while it could surely happen, doesn’t seem likely. If they needed a position player, then maybe. But other than the catcher position, the Rays don’t seem to have any glaring weaknesses among their position players (and they’ve always got Joe Dillon). So, could they do something? Yes. Will they? What do you think? I don’t have a good sense of who’s pitching in Montgomery this year, especially among the starters. So no idea who the Rays might want to have some AAA time. But that could add some interesting variables to the mix. This post is taking a bit longer to type than usual. I’m having to use just my left hand. It seems I threw something out in my right shoulder patting myself on the back for the perspicacity of my analysis this morning. It is certainly a minor quibble that today’s two home runs by Elliot Johnson in the 3rd inning and Ray Sadler in the 5th inning did not win the game; that in fact the winning run was scored on a Ray Sadler single in the 6th. And it is also most certainly a quibble that Tides reliever Jake Arrieta had a complete melt-down later in the 6th, coming in with two outs and the bases loaded and walking in two runs and then giving up a two-run single. As for the four double plays, just business as usual for the Durham infield. The Bulls go into the break tied for first place in the South, not bad considering the last couple of days. My guess is that John Jaso will be back with us by next Thursday. Assume he was warming up pitchers down in St. Pete. Sure hope he doesn’t take the blame for the Rays bullpen giving up 4 runs and the game down there today. Justin Ruggiano was sent for X-rays after getting hit by a pitch on his left hand today. Hope it was only a bruise and he will be back by Thursday as well. Shoulder’s really giving me trouble. Think I’ll just post this and have a celebratory glass of wine. According to brief notes at Rays Index and the St. Petersburg Times, John Jaso has been called up to Rays. Yesterday Rays catcher Dioner Navarro was injured by a foul ball last night, but it was initially reported that he would not be going on DL. However, the Rays have some room on their roster at the moment, so possibly just for a game or two. Looks like Craig Albernaz will get a start. This losing string is very different from the last one, and gives me quite a bit of hope for the future. Yes, we’ve lost four in a row, but not by much: 7-6, 8-6, 6-3, 4-3. So, we’re scoring runs, but it’s been a small-ball run. For better or worse, this season we’ve been living and dying by the homer, and it sure seems like a long time since one of our guys have put one over the wall (Ruggiano on July 8th against Gwinnett). We have not hit a single home run in these last four losses. By the way, if there was any worry that our guys are trying too hard for the home run, the strike out rate doesn’t show it. No doubt they are capable: seems like every batter in the lineup has hit at least a couple this year, just not recently. Has our pitching been shaky? You bet. The opponent’s OPS for the last four games has been well above the average for the year. And although the hitting has been OK, we just haven’t been getting our runners on base across the plate. One game out of first, a chance to tie it up going into the break. I like to think we’re OK.
We’ve got a 1 o’clock game today in Norfolk— I wonder why we never have Sunday afternoon games in Durham? I’d like that. Because of Sonnanstine’s mononucleosis the Bulls will go with “starter by committee” approach. My guess is that they’ll start with Calvin Medlock, who hasn’t been on the mound for Durham since the 2nd of July. Here’s a bit of trivia for you: Today is the ninth game in a row with the same umpiring crew. Wonder why that is? Do managers start gaming the umpires in a situation like that? No one answered my last trivia question. He hasn’t left the Rays bench since the 4th of July. About the AAA All-Star Game: Pleased to see Reid Brignac and Dale Thayer in the game. Am most definitely not pleased with the secretive way the fan balloting has been handled. Search as I might (and I’d be glad to be corrected), I have not been able to find any information on what happened to our votes. So, here’s hoping Reid and Dale enjoy their trip to Portland and enjoy the game, but I don’t think I’ll bother to vote next year. Andy Sonnanstine to disabled list; Calvin Medlock “recalled” from Hudson Valley. That’s all I know. I wasn’t able to listen to the game tonight, so don’t know if anything else was reported. If a reader did hear, please chime in. Update: Have two reports so far, so must be right. Andy has mono, so Bulls will go with "starter by committee" on Sunday. Carlos Hernandez on for tonight. We sometimes forget how young most of these guys are. Here's hoping it doesn't take Andy out for too long. 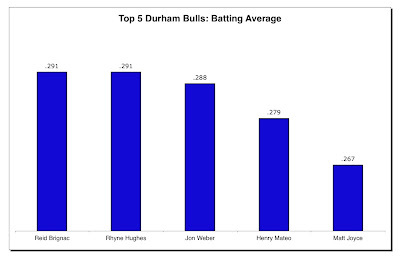 Thought it would be fun to compare the Durham Bulls with our “parent” club as we come up on the All-Star break. We’re 13 games above .500, the Rays are 7 games above .500. The only AAA-affliate of the American League East in our division is Norfolk (Orioles) and they are just behind us at 11 games over .500. The Orioles are 9 games below .500. 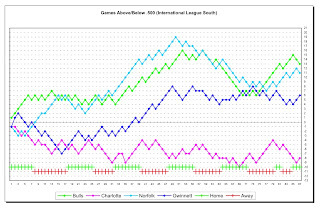 Other AAA affiliates of the American League East in the International League are Scranton/Wilkes Barre (Yankees) who are also 13 games above .500 and Pawtucket (Red Sox) who are 7 games above .500. The Toronto AAA affiliate is in the Pacific Coast League, the Las Vegas 51s, and they are 6 games below .500. As for why the Toronto AAA team is in the Pacific Coast League, I tried to get my head around that one a while back and couldn’t manage it. 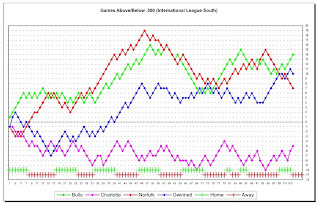 For those who may happen upon this blog and who are unfamiliar with the International League, Charlotte is a White Sox affiliate and Gwinnett is a Braves affiliate. Coming up on the next three games in Norfolk, it sure would help to win the series. That’ll be tough and, as usual in AAA ball, the two teams that played each other back in May are not the same teams that will be playing each other tonight. The bottom-of-the-9th heroics were a thrill, no doubt about it, but the rational part of us knew it was very unlikely. So I’ll look for something else good to say about the game. I don’t have to look far. A pitcher, about whom I don’t recall ever saying anything nice, did a fine job tonight. James Houser has had two decent outings in relief since being pushed into the bullpen by Andy Sonnanstine. I’m beginning to wonder if the right guy got pushed. Last night he went 5 ⅓ innings and gave up 2 earned runs. That compares to starter Matt DeSalvo’s 3 ⅔ innings and 5 earned runs. Houser’s last (and first) stint as a reliever was on July 4th, the 2-11 debacle in Charlotte. There he went 3 ⅓ innings and gave up one earned run. So his ERA as a reliever is a not too bad 2.89. On the other hand, Matt DeSalvo is killing us. He’s yet to win a game in 9 starts. In his last 4 starts he’s lasted 2, 4 ⅔, 2 ⅔, and 3 ⅔ innings. I couldn’t bring myself to go farther back. 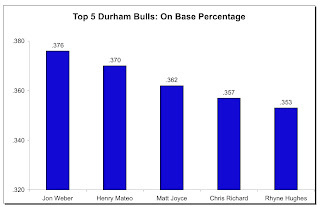 The Bulls/Rays have done a good job signing free agents in the past, but Matt’s not one of them. This series starting in Norfolk tonight is a big deal and we’ve got our best pitchers in the rotation coming up (Davis, Hernandez, and Sonnanstine). Our eleven men to the plate 9th inning last night shows that the offensive power is in good shape. Trivia question: Name that player. He joined the Durham Bulls in early May and played in 12 games with 42 at bats (.262) before departing for Tampa on May 26th. In Tampa his first game was May 27th and he has since played in a grand total of 12 games with 25 at bats (.320 average). Seems to be filling the Gomes/Baldelli seat on the Tampa Bay bench this year. Injury is a bruised calf and Ray Olmedo is day-to-day. Not sure exactly what that means, but probably that he’s not going on the disabled list. Good news. As for how you bruise a calf muscle coming around third base, I’m guessing that the injury actually came earlier in the base running sequence and when trying for home after Richard’s single he discovered that he just couldn’t make it. But my guesses are usually not very reliable. Grass is beginning to look a bit parched out here in center field, and not too many fans today. Nice kids out here though. Sure hope I’ll be able to toss them a ball sometime tonight. The Bulls are ahead of us by 5-3, but we can get that back. Particularly if I keep banging the ball off that wall to my left. I’ve got two doubles so far, and I’ve scored two of our three runs. Joyce really nailed me with that throw last inning and even though I hammered him, Jaso didn’t drop the ball. Maybe I can get another hit the next time I’m up and we’ll be back in the game, even with that old man pitching for us since Reyes left. That kid, Rhine Hughes in on first. No problem there. Mateo’s up. Here it comes. Let me just drift off to the left and get under it. Yeah, I’ve got it. Just toss it up to the kids and trot in. Wonder why nobody else is heading for the dugout? How come that kid Hughes is being signaled to take third? Damn! How many outs are there? Just two? Interesting night at the DBAP, and it’s gonna be fun to razz Reid Gorecki the rest of the time Gwinnett is here. Sonnanstine pitched a decent game, even if he had a bit of trouble the first two innings, he seemed to have things well in hand through the 7th. Nice long start. Ruggiano, even with his K in the 2nd, seems to have sorted himself out. And he hit his twelfth homer, a 3-run shot in the 5th to push his RBIs up to a team-leading 48. A very, very pretty throw from Joyce to Jaso in the 5th. Jaso blocked the plate perfectly and Gorecki could only try crashing into him to try to shake the ball loose. Didn’t work. Blunder by Gorecki in 6th gave us a run. Poor performance by Braves reliever Gunderson in the 8th gave us 2 more. Good night. Nice to see Charlie Montoyo back and to know that his son came out of surgery OK.
Winston Abreu had an inauspicious beginning with the Indians last night. Came on in the bottom of the 7th against the White Sox. Walk, homer, strike out, single, homer, pulled from the game; that’s 1/3 inning, 3 hits, four earned runs, 1 walk. His ERA ballooned up to 11.25. On the other hand, he hadn’t pitched since June 23rd. A fantasy of any player or fan has got to be a 9th inning, 2 out, bases-loaded, 3-2 count grand slam home run. Well it happened last night for Elliot Johnson and Durham Bulls fans. Congratulations to Elliot. The Bulls had just gone ahead on John Jaso’s bases-loaded single. And that followed an interesting string of problems created by Jon Link, Charlotte’s closer. First a single by Jon Weber to start the inning. Then Link threw the ball past first allowing Weber to go all the way to third base. Then Link walked Matt Joyce, struck out Justin Ruggiano (during the at-bat Joyce got to second on a steal or defensive indifference), but gave an intentional walk to Chris Richard (a good idea, I’d say, given the Chris’ reputation) to get to Jaso. Jaso screwed up that plan with a single, scoring the go-ahead run. Sadler struck out. Johnson cleared the bases. A bit lost in the noise was Ray Olmedo’s home run in the 3rd, his 5th and his 27th (!) RBI on the year. Charlie Montoyo returns to the Bulls for tonight’s game with the Gwinnett Braves. The Bulls are 8-1 since he left. Does Dave Myers get a raise? John Jaso, taking a lesson from Jon Weber, tossed a bat into the stands last night. Last night was the Bulls 84th game of the season. Their “parent” club, the Tampa Bay Rays have played 83. The Rays started their season before the Bulls. How come they’ve played fewer games? More days off. This goes back to an item I posted back in June — minor leagues play ball at a harsher pace than the majors. Their season is shorter, but they play harder. Another reason for the position players to get regular days off. Out on the web Rays Index stirred the pot of the Jackson/Joyce trade by noting an article in a Minneapolis newspaper. Other bloggers took up the cry including Rays All Day and The Rays Revolutionary. Fun reads. One of my favorite sites is Flip Flop Fly Ball, which specializes in interesting graphics illustrating different aspects of the game. He’s got two new ones up. Dock of the Rays says that Price should be sent back to us, with lots of stats. The Rays Party stirs up trade ideas and mentions our Mitch Talbot, Dale Thayer, and Justin Ruggiano. The Rays Party also has a useful list of Rays-related blogs, including WDBB. 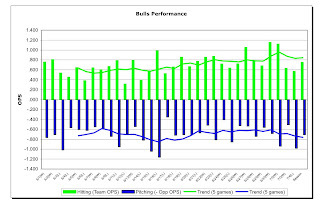 I don’t really want to say anything about last night’s 11-2 loss, so thought I’d update my charts on our Durham Bulls. The performance chart looks at the games since June 1st, so it shows the mid-month losing stretch and the late June - early July winning streak. As before, the last bar is the number for the entire season. That is, the team OPS for the season is .750, and our opponents’ OPS (a measure of how well our pitchers are doing as a group) is .707 (charted as a negative number so the closer to the base line the better our pitchers are doing). 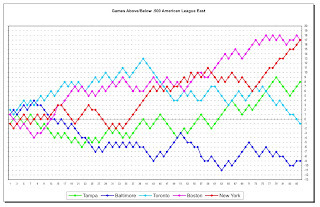 The trend line is a simple 5-game moving average. The good: the hitting trend is up, way up, above the season number. That reflects all the homers recently, but it also reflects better plate discipline since OPS includes how often a batter walks (and/or gets hit by a pitch). The not-so-good: the pitching trend line is down. More than anything else, I think that is essentially turmoil in the pitching staff. We’ve had lots of different pitchers on the mound over the last month -- 20 different pitchers in Bulls uniform since the first of June. Even though I’m somewhat skeptical of catcher John Jaso’s talents, you’ve got to admit that figuring out to handle 20 different guys is quite a challenge. For the pitching chart, I’m showing only the pitchers on the roster today (as of about 11 am, it could change at any minute). 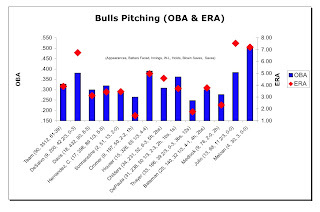 The sample sizes are bizarre, so this chart isn’t really of much use except to show that a few have become stalwarts both as starters and relievers. Specifically: Davis, Hernandez, Cromer, and, probably Sonnanstine form a pretty formidable starting crew. As relievers we’ve got Childers, Thayer, and Bateman who are very solid. No way to tell if Houser will work out. We’ll see. Similarly for Meloan. He has a good rep and it will take much more than one inning in a blown out game to see what he’s got. Here’s the bare bones of it: Chris Nowak to Montgomery and Calvin Medlock to Hudson Valley (wonder if he’ll be there in time for the “Ball-less Baseball game”?). Elliott Johnson is off the disabled list and reliever John Meloan has apparently joined the team. Looks like Adam Sobsey over at Triangle Offense/Indy Week called the Nowak move correctly, and it makes sense to me. Moving Medlock makes much less baseball sense, so has to be more about the business of baseball than the playing of baseball. Something we have to live with, I suppose. But even with his limited appearances he was clearly a better pitcher than at least two of the other relievers on the squad. Hope we see him back before too long. As Adam points out, the guy in the grey sweatshirt on the Bulls bench just might be Calvin. Don’t know if Elliot will be in the lineup tonight. We’ll have to wait for Neil Solondz or Gameday to tell us. Our congratulations to the entire team for their extraordinary seven game run, their 47-34 won-loss record, and leadership of the entire International League. Well done! On behalf of the entire Jason Cromer Fan Club (which has tripled in size since our last letter ) we wish to extend our heartfelt thanks to Reid Brignac. Without his timely breakout of his mild slump with those two home runs and three RBIs yet another of Jason’s efforts would have gone unremarked — except by us, of course. A stalwart six innings on his part (we’d rather not discuss the seventh). In addition to Reid’s heroics we want to thank Jason Childers (3 up, 3 down), Joe Bateman (3 up, 3 down), and Dale Thayer (3 up, 3 down) who kept the Knights runnerless and scoreless. Particularly notable was Jason Childer’s 7th inning. But we have to point out that with a more thoughtful management it might not have been necessary. As good a pitcher as Cromer is, he usually tops out at about 100 pitches or 24 batters, as a cursory review of his record would reveal. So perhaps next time warm up a reliever before Jason needs to be bailed out. In addition to Jason’s superb performance, I am sure you would agree that it was a superb night for baseball: colorful uniforms, perfect weather, and a full stadium. I’m sure that we all were stunned at Henry Mateo’s giving the phrase “shelling the pitcher” reality when he literally knocked Charlotte pitcher Jack Egbert out of the box in 3rd. By the way, we noted that a Rays blog, DRaysBay has noticed Henry and done an interesting write up on his performance this year. In your response to our last letter you mention that you had had a discussion with Jon Weber regarding his errant bats. Since that time he has loosed two more in our direction. As several members of the JCFC are seated near us, we are requesting additional counseling of that hirsute young man. But not, as last night, benching him. That is simply too extreme a measure. Assuming that you will be conveying the substance of this note to the Bulls and Bulls management, here are a few other items we would like you to pass on. To Matt Joyce. We are of the opinion that he may have had the longest at-bat in Bulls history on the evening of July 2nd when his at-bat was interrupted by a 23 minute rain delay. A Rays farm team, the Hudson Valley Renegades is achieving national fame with their “Ball-Less Baseball” promotion. Since at least half of the JCFC are of the male gender, we request that you not emulate the Renegades. Lastly, we had to find out from Stacy Long in Montgomery, Alabama that a Durham Bull, Chris Nowak, is leaving us for the Biscuits. How is it we have to keep checking Stacy’s blog to find out what’s happening in Durham? Really, really nice to see the Bulls back in town, even if it’s only for a couple of days. Six in a row! The Rays/Bulls dumped Dewon Day today. Someone had to go once Sonnanstine came on the roster. I understand that. But why Day and not Julio? Day isn’t exactly a standout. In 22 appearances he pitched 18 ⅓ innings, had a 3-1 record and an ERA of 3.95 and Opponents On Base Percentage (OBA) of .386. But Julio, who came to us from Milwaukee in early June over 9 appearances (9 ⅔ innings) has an ERA of 9.31 and OBA of .404. Makes no sense to me. In fact, the only thing that makes any sense at all is that there’s something in the fine print of their contracts that made it easier to dump Day than Julio. ... and gave up three runs on a double, a walk, and a homer. Medlock (he’s looking pretty good since he joined us) and Thayer finished it up, although Dale did give up a rare home run to make it exciting. But the hitting, that was really pretty. Home runs by Joyce, Weber, and Richard. Doubles by Joyce, Weber, and Richard. RBIs by those three plus Ruggiano. And extraordinary plate discipline by Henry Mateo resulting in 2 hits, a walk, and 2 runs scored. Now to the really important stuff. Hirsuteness changes: Jon Weber has sprouted some hair around his head. Looks good, Jon. Dale Thayer shaved his ‘stach and sideburns. Since both had good nights, maybe a good thing. Jon Weber launched his fourth bat in my direction tonight. This is the Tar Heel State, Jon. Gotta be some pine tar around here somewhere — assuming that’s still legal. I’ve still got more hair than you, Jon, but you’re catching up. The Bulls have updated their roster, but Joe Bateman’s still not on it. The Rays certainly did a number on Winston Abreu. It probably won’t cost them too much since the Rays can’t beat the Indians in the best of times. But it’s gonna be even more embarrassing if Abreu beats them sometime later this year. Especially with the experience they’ve had with Isringhausen and Percival. By my count, two more pitchers are gonna have to go soon. One when Meloan shows up, another when Mitch Talbot comes off the DL. Maybe, Julio will go. If this year’s numbers mattered Houser would be next, but I’m guessing DePaula is not long for the Bulls. Notice Houser strolling down toward the bullpen tonight. Assume he’s out of the rotation. Are they going to try him as a reliever?